This is a pre-copyedited, author-produced version of an article accepted for publication in Scholarly Editing following peer review. The version of record, Andrew N.J. Dunning, ‘Hugh of St Victor’s De quinque septenis (On the Five Sevens) and Its Versification in Samuel Presbiter’s De oratione dominica (On the Lord’s Prayer)’, Scholarly Editing 37 (2016), is available online at http://scholarlyediting.org/2016/editions/intro.dunning.html. I undertook this project primarily as experiment in digital editing to see its strengths and weaknesses in comparison to traditional methods, after seeing Notes from the School of William de Montibus through print. The source files are available online and provided under a Creative Commons Attribution licence. Hugh of St Victor’s De quinque septenis (On the Five Sevens) encapsulates the full scheme of the seven deadly sins in the high medieval period – today both widely recognized in popular culture and misunderstood. He links the vices with four other groups of seven: the requests of the Lord’s Prayer (using the version in Matthew 6:9–13), the gifts of the Holy Spirit (based on Isaiah 11:2–3), the virtues, and the beatitudes (Matt. 5:3–9).1 Hugh’s accessibility and logic made it appealing to anyone wishing to teach these subjects, and the work was widely copied for the remainder of the Middle Ages.2 Later writers also adapted its contents to present Hugh’s thought in new ways. Samuel Presbiter’s De oratione dominica is a versification of De quinque septenis, written around the turn of the thirteenth century. 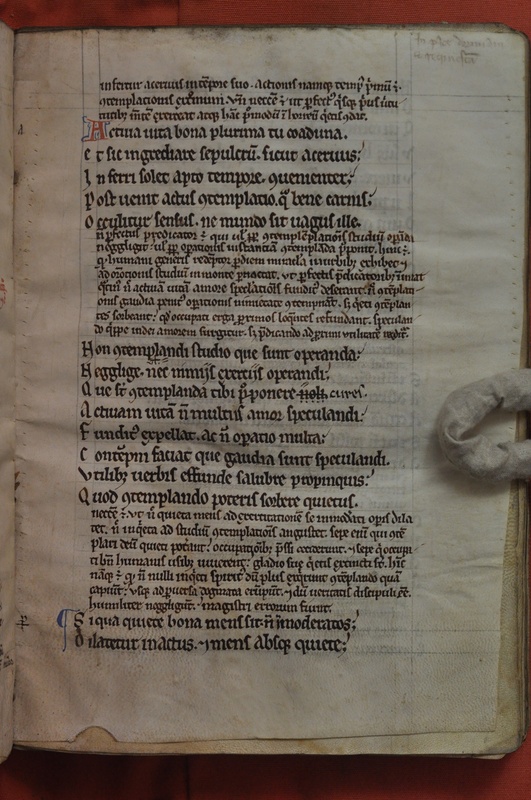 Hugh’s work has been printed many times; this article presents a documentary edition of Paris, Bibliothèque Mazarine, MS 717, representing the edition of Abbot Gilduin made shortly after Hugh’s death. De oratione dominica has never been studied or published, and survives in a single manuscript from Bury St Edmunds that was likely corrected by its author, now Cambridge, Pembroke College, MS 115. Both works are here presented for the first time with an English translation. De quinque septenis presents itself as a letter to a fellow monastic, responding to a request for an explanation of five groups of seven phenomena Hugh identifies in scripture. It is difficult to deduce anything concerning the situation in which this arose: nothing in the tone indicates whether it was a topic that arose in casual conversation with a friend, or an enquiry from a distant correspondent pressing for further detail on the subject. Hugh also writes on the subject in De septem donis spiritus sancti and De oratione dominica (the latter of which might have inspired the title of Samuel’s versification). Roger Baron suggests that the letter was a logical outgrowth from Hugh’s earlier work De institutione nouitiorum.8 De quinque septenis is an effective and focused tool for teaching and internalizing a practical aspect of salvation. The text of De quinque septenis found on fols. 210va–212rb is written in a single protogothic hand. The scribe usually joins prepositions such as “ab” to the following word. The text is moderately abbreviated, but the scribe usually writes out “anima” and “dominus” rather than using the standard contractions. It is contained within a single gathering: the catchword on fol. 211v was used for assembling the gathering, and does not indicate its end.36 It opens with a blue two-line capital, with red penwork. A small amount of red ink matching the shade of the initial on fol. 212rb has been spilled on fol. 211ra. It has been corrected by at least one reader, distinguished by a hand with thin strokes. This might be a contemporary corrector working with the scribe, as most of the ninth line on fol. 211rb (beginning “subueniat saluatoris”) has been erased and rewritten in what appears to be the same hand, compressed in order to fit into the limited space. One paragraph mark has been added in the margin in plummet on fol. 210vb, dividing what could be conceived as the introduction from the rest of the work. A later annotator (designated B in the edition) has added six inline paragraph marks in addition to running labels in the margins highlighting the numbers in the text, and flags several key passages with a set of three dots and a vertical line. Baron does not represent the Mazarine manuscript accurately: he indicates that it reads “ad inuicem” at fol. 210va rather than “abinuicem” (a variant he ascribes only to Va), “ipsi” (the reading of the PL) at fol. 211ra rather than “sibi” (not reported as a variant), and “docetur” at fol. 211vb rather than “donatur” (which he ascribes only to Va, H, and L). He arbitrarily classicizes many spellings. While his text superficially follows the punctuation of the manuscript, he freely modifies it, often detrimentally: for instance, on fol. 210vb, the sentence “Cur nisi … amittat” ends not with Baron’s question mark but more correctly with a simple punctus; Hugh has finished his interrogation of pride, and is now stating the force of its destruction. In fairness, it should be noted that the edition was published posthumously,44 and some of these errors might not have occurred had Baron lived to see it through the press. While his choice of manuscript is good, it has more unique and potentially correct readings than he shows. The present edition emends the manuscript only where required for sense. Only a few significant modifications to the text are necessary. At fol. 210vb, “se” is suppressed in “ab illuminante se auertitur”, reported by Baron as occurring only in the Mazarine manuscript. While it can be found in at least one other witness,45 the usage of the previous sentence indicates that this is an error. At fol. 211ra, “quatum” is replaced with “quantum”, and at fol. 211va, “uenerati” with “uenerari”: these corrections are also made by Baron but not reported. Prepositions are separated where appropriate in the regularized form of the edition. Samuel Presbiter (fl. 1200) is known to history only through the preservation of his works in two volumes from the abbey library of Bury St Edmunds, now Cambridge, Pembroke College, MS 115 and Oxford, Bodleian Library, MS Bodley 860 (SC 2723). His writings largely excerpt and versify earlier prose works. De oratione dominica is a versification of Hugh’s De quinque septenis. Extracts from Hugh’s prose are copied between the verses as a commentary, a format Samuel uses in several of his works. The change in title reflects a shift in focus. While the verses summarize each of the groups of five, there is a stronger focus on the Lord’s Prayer, and its worthy (digna) invocation. The result is an epitome of Hugh’s work, removing the frame of a letter, presenting the source material from the Sermon on the Mount more explicitly, and providing a series of verses that could be memorized in order to recall the full contents of the whole. The only overt indicators of chronology for these works are that Ex auditis super psalmos and Ex diuersis auditis reflect Samuel’s studies under William de Montibus, while Ad habendam memoriam was written after he left the school, according to the extended heading with which the work begins. The two Ex speculo works abridge the Speculum Gregorii, Adalbert of Metz’s epitome of Gregory the Great’s Moralia in Iob;55 many copies of it existed in England, including one at Bury St Edmunds by the late twelfth century.56 Samuel also refers to it in his paraphrase of Psalm 1 (for example, Bodley 860, fols. 4r, 5r) and Ad habendam memoriam (fols. 128v, 130r). These works are also his most mature: the marginal glosses reflect increased confidence to work directly with biblical texts as well as secondary theological works, and often amalgamate references to many titles rather than summarize a single source. De oratione dominica summarizes the entirety of Hugh’s system of five groups, typically beginning with an indication of which vice the request addresses, followed by the gift of the Holy Spirit given in response, the corresponding virtue that comes from this, and the resulting beatitude. Its hexameter verses are organized into eight stanzas: one introductory, and one for each of the requests in the Lord’s Prayer. In Samuel’s other writings, verses are frequently presented to be memorized in order to learn the details of a particular concept, and the intent is presumably the same for this work. The commentary to the verses is a direct abridgement of De quinque septenis, reorganizing the text and adding quotations of the Beatitudes. Samuel eliminates most of the details of the discussion concerning the effects of the vices. After quoting Hugh’s basic definitions of the correlation between the groups of seven, they are repeated for easier reference above the corresponding verse. The emphasis is placed on understanding the practical workings of the Lord’s Prayer, and not on the effects of vice. Connecting words such as ergo are usually removed from Hugh’s prose. The cumulative effect of these changes is to transform Hugh’s work into a more efficient and direct treatise that could be quickly internalized. One could memorize Samuel’s verses to remember the system, and refer to his text when necessary to find the most useful passages from Hugh. While his text survives in only one manuscript, Samuel was not the only reader to look for better ways to navigate De quinque septenis, and indeed in Mazarine 717 marginal labels have been added to make it easier to refer to the text. In many ways, De oratione dominica would be most helpful to someone who had already read Hugh’s text. Yet while it can be seen from the list of Samuel’s works that he is normally careful to cite the sources he uses, De oratione dominica is an exception: he does not give any indication that it is copied from another source. This is typical of the intellectual culture of the Middle Ages, in which there was immense freedom to adapt the writings of others. This sometimes leaves today’s readers, unfamiliar with the writings of the period, with the concern that medieval writers intended to pass off the work of others as original. It might be argued that Samuel’s audience would have been so familiar with the work that they would recognize the source immediately. He might have had access to a copy of De quinque septenis at either Lincoln or Bury St Edmunds: three copies of the work survive in the library of Lincoln Cathedral, two from the twelfth century and one from the thirteenth;57 Bury St Edmunds owned at least two copies, from the late twelfth and early thirteenth centuries.58 In Ex diuersis auditis, Samuel’s citations function to remind the reader of the authority of the texts he uses, and not to provide a location where the original might be found. He normally gives some form of attribution to biblical and classical sources, but the few references to works written within the preceding century are mostly integrated without comment. Hugh had been dead for little more than half a century when Samuel was writing, and his reputation was still rising. It was only the biblical sources that needed to be identified in order to communicate the subject at hand, and Samuel enhanced the citation of these over Hugh’s original. Whereas many of Samuel’s other works were written in Leonines, which use an internal rhyming scheme, De oratione dominica is composed in unrhymed hexameter, usually but not always with a caesura in the third foot. The syntax is not complex. They are not particularly artful, but they are highly serviceable. Distinction in Cambridge, Pembroke College 115, fol. 1r. Mens conseruetur per opus ne stulta uagetur. Sic studiis detur ut que prosint operetur. Mens conseruetur ut que prosint operetur. Sic studiis detur per opus ne stulta uagetur. The mind is maintained through work lest it roam in stupidity. Thus it is given to study so that it may labour on useful things. The mind is maintained that it may labour on useful things. Thus it is given to study through work lest it roam in stupidity. Distinction in Cambridge, Pembroke College 115, fol. 76r. Hec qui collegit eterna pace quiescat. Hec quicumque legit oret simul ut requiescat. Hec quicumque legit eterna pace quiescat. Hec qui collegit oret simul ut requiescat. May he who collected these things sleep in eternal peace. May whoever reads these things pray likewise that he may rest. May whoever reads these things sleep in eternal peace. May he who collected these things pray likewise that he may rest. These passages are highly characteristic of Samuel’s intellectual milieu. Their presence indicates that these two manuscripts were planned together in the form in which they have survived. These are collections of earlier units: Bodley 860 is a composite of three booklets, while Pembroke College 115 can be divided into two parts. 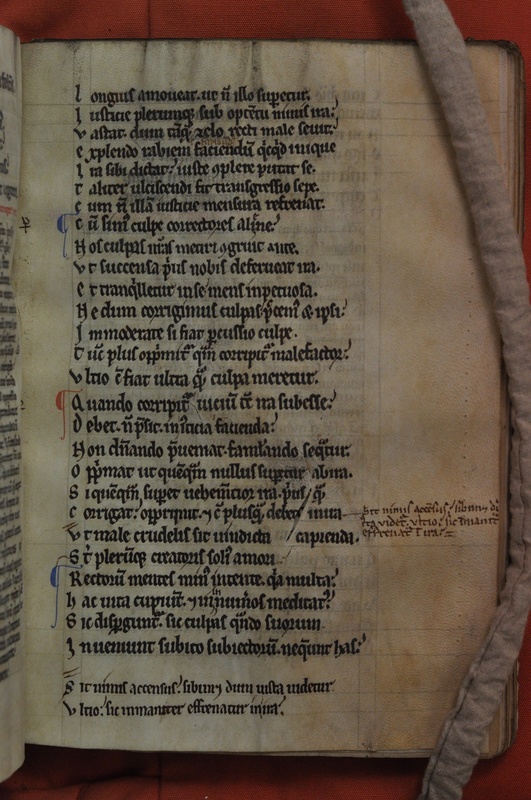 Similar to the way in which Mazarine 717 represents a conscious effort to assemble the works of Hugh of St Victor, the Bury manuscripts are an attempt to provide Samuel’s writings in a presentable form, in this case with the author’s own involvement. The volume is collated 18–58, 68–2 (7/8 cancelled) || 78–98, 108–1 (8 cancelled). The cancelled leaves between fols. 46 and 47 would presumably have been blank, as is fol. 46v: the contents are uninterrupted. The second booklet corresponds to Collecta ex speculo beati Gregorii sine uersibus, which has different ruling (in plummet rather than pencil) and a simpler scheme of decorated capitals from the rest of the volume. The same fashion of the final booklet of Bodley 860, the order of the internal pages of most gatherings are designated by letters, and a number (·i· through ·ix·) is found at the end of each gathering at the bottom of the page, in the centre, written in ink. While the page layout is visually similar to Bodley 860, the ruling pattern differs slightly. In the Pembroke manuscript, the line spacing is variable, generally leaving 4.5 mm for prose and 7 mm for verses. This appears to have been done before the page was copied, and where this was not correctly planned, either the verse has to span two lines or a 7 mm line is subdivided for two shorter lines of prose. This can be seen, for example, on fol. 6r. The lines of the prose passages in Bodley 860 are similarly 4.5 mm high, but two full lines (9 to 10 mm) are left for the verses, simplifying the page preparation process. Variable ruling on Cambridge, Pembroke College, MS 115, fol. 6r. The evidence suggests that Samuel was involved personally in the production of Pembroke College 115 and Bodley 860, with a correcting hand found in both manuscripts. This corrector is intimately familiar with the text, and seems to have gone through it methodically after it was copied; he leaves a faint note in the lower corner of MS Bodley 860, fol. 103r that reads “usque hunc in parte”. Its contemporaneity is demonstrated by fol. 39r, where one also finds additional verses copied into the margin, in turn recopied by a contemporary scribe imitating the original hand. The correction has been trimmed in binding, and as the manuscript appears to be in its original medieval binding, this was probably done at the time of production. While this correction might have been caught by anyone working with the exemplar, the same hand also makes original revisions to the text. The corrector is also highly interested in detail, extensively revising the punctuation (often, for instance, changing a punctus to a punctus eleuatus). The most likely identity for this corrector is Samuel himself. 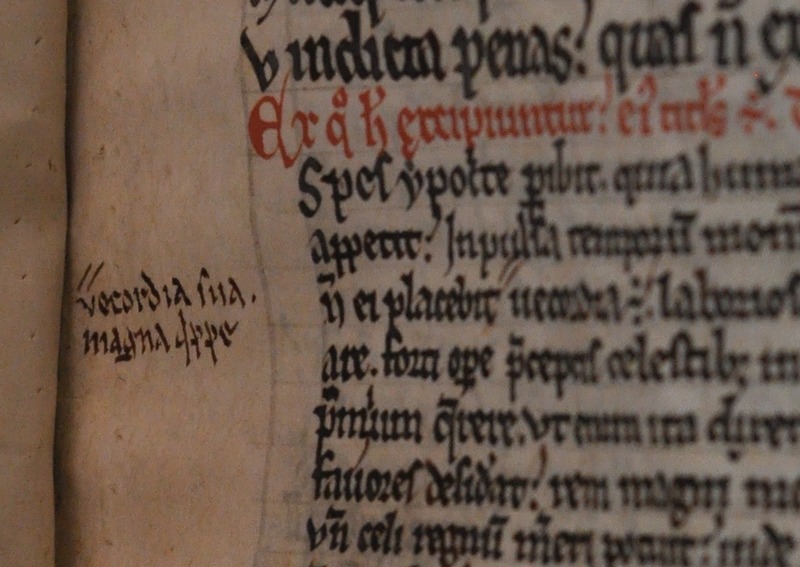 Marginal correction to Cambridge, Pembroke College, MS 115, fol. 28r. Inline and marginal corrections to Cambridge, Pembroke College, MS 115, fol. 39r, with added verses later recopied at the bottom of the page by a contemporary scribe. Inline and marginal corrections to Cambridge, Pembroke College, MS 115, fol. 66r. As Cambridge, Pembroke College, MS 115, fols. 41v–44v is the sole witness to De oratione dominica, and it has never been previously edited, a documentary edition of this manuscript encapsulates the full known material evidence of this text. In this situation, one of the best things that an editor can do is to create an edition that can be cited in the same way as the manuscript. For instance, while Baron’s edition of Mazarine 717 cites the folio and column breaks (though a few are missing), the only possible method of referring to a more specific passage in Hugh’s text is to use the line numbers in Baron’s own edition. Some scholars have instead chosen to refer to the Patrologia Latina columns (not included in the Baron edition) and use Migne’s text. By instead recording the position of line breaks in the manuscript, one can maintain the citation systems that already exist, and refrain from perpetuating a new scheme. This is, indeed, a necessity for the flexible layout of electronic texts, where stable references must refer either to a physical object or a semantic division. One of the problems of De oratione dominica (like all of Samuel’s verse-prose compilations) is that its layout does not fit with a key modern assumption of how a book should work: one cannot start reading at the top of the page and scan to the bottom. Instead, the text begins with the commentary, which is pared with the applicable line of verse below it. The commentary is far longer than the verses, meaning that the individual verse of the poem must be searched out over the entire text. In a printed version of this text, an editor would be forced to choose between rearranging the text to promote readability, and bringing the reader to the original – maintaining the ability to cite the manuscript by folio, the possibility of making better historical inferences about how readers might have used the text, and the prospect of experiencing non-linear habits of reading. This is only possible by relying on semantic categories rather than typographical conventions to interpret the text (for example, explicitly marking a line as verse rather than simply displaying it in enlarged type), and displaying the text in both documentary and regular forms. This is a distinct advantage of presenting texts in a digital format. While the verses of De oratione dominica do not require emendation, its rendition of Hugh’s prose is much less accurate. The text is slightly different from that of Mazarine 717, including a few variants recorded by Baron, though not corresponding to any one of his manuscripts. The manuscript’s punctuation has been retained with some minor corrections, but the capitalization is partially editorial. It was a common scribal practice in this period to use capital letters only to indicate the beginning of a sentence: this is the generally the rule for Pembroke 115, and the edition attempts to preserve this, but the script’s execution leaves ambiguity between many majuscule and minuscule characters. This article benefited from the criticism of two anonymous readers. Images of Cambridge, Pembroke College, MS 115, taken by the author in November 2013, are reproduced here by permission of the Master and Fellows of Pembroke College, Cambridge. Images of Paris, Bibliothèque Mazarine, MS 717 are reproduced courtesy of the Bibliothèque Mazarine. Abbey of St Victor, Paris. M. Hugonis de S. Victore, canonici regularis, sancti Victoris parisiensis, tum pietate, tum doctrina insignis; Opera omnia tribus tomis digesta. 3 vols. Rouen: Berthelin, 1648. Adriaen, Marc, ed. S. Gregorii Magni Moralia in Iob. Corpus Christianorum, series latina 143, 143a, 143b. Turnhout: Brepols, 1979–1985. Baron, Roger. Études sur Hugues de Saint-Victor. Paris: de Brouwer, 1963. ———. “Étude sur l’authenticité de l’œuvre de Hugues de Saint-Victor d’après les manuscrits Paris, B. Mazarine 717, BN 14506 et Douai 360–366.” Scriptorium 10, no. 2 (1956): 182–220. https://doi.org/10.3406/scrip.1956.2703. ———. “Hugues de Saint-Victor: Contribution à un nouvel examen de son œuvre.” Traditio 15 (1959): 223–97. https://doi.org/10.1017/S0362152900008254. ———. Hugues de Saint-Victor. Six opuscules spirituels. Sources chrétiennes 155. Paris: Cerf, 1969. Bernard, Edward. Catalogi librorum manuscriptorum Angliæ et Hiberniæ in unum collecti. 2 vols. Oxford: Sheldonian Theatre, 1697. Berndt, Rainer, ed. Hugonis de Sancto Victore De sacramentis Christiane fidei. Corpus Victorinum, Textus historici 1. Münster: Aschendorff, 2008. Bloomfield, Morton W., Bertrand-Georges Guyot, Donald R. Howard, and Thyra B. Kabealo. Incipits of Latin Works on the Virtues and Vices, 1100–1500 A.D.: Including a Section of Incipits of Works on the Pater Noster. Mediaeval Academy of America Publication 88. Cambridge, MA: Mediaeval Academy of America, 1979. http://hdl.handle.net/2027/heb.31131.0001.001. Boyle, Leonard E. “The Inter-Conciliar Period 1179–1215 and the Beginnings of Pastoral Manuals.” In Miscellanea Rolando Bandinelli, Papa Alessandro III, edited by Filippo Liotta, 45–56. Siena: Accademia senese degli intronati, 1986. Buttimer, Charles Henry, ed. Hugonis de Sancto Victore Didascalicon de studio legendi: A Critical Text. Washington, DC: Catholic University Press, 1939. Caillau, Armand-Benjamin, and Benjamin Saint-Yves, eds. Sancti Aurelii Augustini Hipponensis episcopi Operum supplementum I. Continens Sermones ineditos extractos ex Archivio Montis-Cassini et ex Bibliotheca Laurentiana-Medicea Florentiæ. Paris: Parent-Desbarres, 1836. Carruthers, Mary J. The Book of Memory: A Study of Memory in Medieval Culture. 2nd ed. Cambridge Studies in Medieval Literature 10. Cambridge: Cambridge University Press, 2008. https://doi.org/10.1017/CBO9781107051126. Cleaver, Laura. 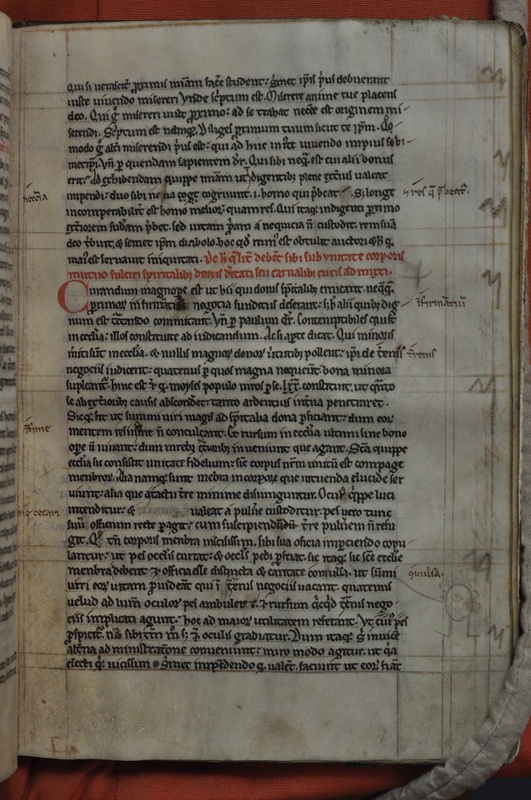 “Past, Present and Future for Thirteenth-Century Wales: Two Diagrams in British Library, Cotton Roll XIV.12.” Electronic British Library Journal, 2013. https://bl.uk/eblj/2013articles/article13.html. Clichtove, Josse, and Pierre de Porta, eds. In hoc libro contenta opera Hugonis de Sancto Victore. De institutione novitiorum. De operibus trium dierum. De arra anime. De laude charitatis. De modo orandi. Duplex exposito orationis dominice. De quinque septenis. De septem donis Spiritus Sancti. Paris: Stephanus, 1506. http://lib.ugent.be/catalog/bkt01:000321097. Coolman, Boyd Taylor. “Hugh of St. Victor.” In The Sermon on the Mount Through the Centuries, edited by Jeffrey P. Greenman, Timothy Larsen, and Stephen R. Spencer, 59–80. Grand Rapids, MI: Brazos Press, 2007. ———. The Theology of Hugh of St. Victor: An Interpretation. New York: Cambridge University Press, 2010. Deferrari, Roy J., trans. On the Sacraments of the Christian Faith (De sacramentis). Mediaeval Academy of America Publication 58. Cambridge, MA: Mediaeval Academy of America, 1951. Diem, Albrecht. “Virtues and Vices in Early Texts on Pastoral Care.” Franciscan Studies 62 (2004): 193–223. https://doi.org/10.1353/frc.2004.0008. Dinkova-Bruun, Greti. “Biblical Versifications from Late Antiquity to the Middle of the Thirteenth Century: History or Allegory?” In Poetry and Exegesis in Premodern Latin Christianity: The Encounter Between Classical and Christian Strategies of Interpretation, edited by Willemien Otten and Karla Pollmann, 315–42. Supplements to Vigiliae Christianae 87. Leiden: Brill, 2007. https://doi.org/10.1163/ej.9789004160699.i-364.65. ———. “Samuel Presbyter and the Glosses to His Versification of Psalm 1: An Anti-Church Invective?” In Florilegium mediaevale: Études offertes à Jacqueline Hamesse à l’occasion de son éméritat, edited by José Francisco Meirinhos and Olga Weijers, 155–74. Textes et études du moyen âge 50. Louvain-la-Neuve: Fédération Internationale des Instituts d’Études Médiévales, 2009. https://doi.org/10.1484/M.TEMA-EB.4.00759. Dunning, Andrew N.J. Samuel Presbiter: Notes from the School of William de Montibus. Toronto Medieval Latin Texts 33. Toronto: Pontifical Institute of Mediaeval Studies, 2016. Edstam, Torsten Kitada. “From Twelfth-Century Renaissance to Fifteenth-Century Reform: The Reception of Hugh of St. Victor in the Later Middle Ages.” PhD diss., University of Chicago, 2014. http://search.proquest.com/docview/1615129493. Foster, C.W., and Kathleen Major, eds. The Registrum Antiquissimum of the Cathedral Church of Lincoln. 10 vols. Publications of the Lincoln Record Society 27–29, 32, 34, 41, 42, 46, 51, 62, 67, 68. Hereford: Lincoln Record Society, 1931–1973. Ghellinck, Joseph de. “La table des matières de la première édition des œuvres de Hugues de Saint-Victor.” Recherches de science religieuse 1 (1910): 270–89, 385–96. Giraud, Cédric, and Patricia Stirnemann. “Le rayonnement de l’école de Saint-Victor: Manuscrits de la Bibliothèque Mazarine.” In L’école de Saint-Victor de Paris: Influence et rayonnement du Moyen Âge à l’époque moderne, edited by Dominique Poirel, 653–66. Bibliotheca Victorina 22. Turnhout: Brepols, 2010. https://doi.org/10.1484/M.BV-EB.3.4430. Goering, Joseph W. William de Montibus (c. 1140–1213): The Schools and the Literature of Pastoral Care. Studies and Texts 108. Toronto: Pontifical Institute of Mediaeval Studies, 1992. Goy, Rudolf. Die Überlieferung der Werke Hugos von St. Viktor: Ein Beitrag zur Kommunikationsgeschichte des Mittelalters. Monographien zur Geschichte des Mittelalters 14. Stuttgart: Hiersemann, 1976. Gransden, Antonia. A History of the Abbey of Bury St Edmunds, 1182–1256: Samson of Tottington to Edmund of Walpole. Studies in the History of Medieval Religion 31. Woodbridge, Suffolk: Boydell Press, 2007. Green, William M. “Hugo of St. Victor: De tribus maximis circumstantiis gestorum.” Speculum 18, no. 4 (October 1943): 484–93. https://doi.org/10.2307/2853664. Hauréau, Barthélemy. Les œuvres de Hugues de Saint-Victor: Essai critique. Paris: Hachette, 1886. https://archive.org/details/lesoeuvresdehugu00haur. Hugo de Sancto Victore. Didascalicon de studio legendi et alia opuscula. Strasbourg, 1474. https://nbn-resolving.org/urn:nbn:de:hbz:061:1-68066. Hunt, R.W., Falconer Madan, and P.D. Record. A Summary Catalogue of Western Manuscripts in the Bodleian Library at Oxford. 7 in 8 vols. Oxford: Clarendon Press, 1895–1953. Inguanez, Maurus. Codicum casinensium manuscriptorum catalogus. 3 vols. Monte Cassino, 1915–1941. James, M.R. “Bury St. Edmunds Manuscripts.” English Historical Review 41, no. 162 (April 1926): 251–60. https://doi.org/10.1093/ehr/XLI.CLXII.251. ———. On the Abbey of S. Edmund at Bury. Cambridge: Cambridge Antiquarian Society, 1895. https://archive.org/details/abbeyofsedmundat00jame. James, M.R., and Ellis H. Minns. A Descriptive Catalogue of the Manuscripts in the Library of Pembroke College, Cambridge, with a Hand List of the Printed Books to the Year 1500. Cambridge: University Press, 1905. https://doi.org/10.1017/CBO9780511692796. James, Thomas. Ecloga Oxonio-Cantabrigiensis. 2 vols. London: Bishop and Norton, 1600. Knauer, Peter S., trans. Hugo von Sankt Viktor. Über die Heiltümer des christlichen Glaubens. Corpus Victorinum, Schriften 1. Münster: Aschendorff, 2010. Lemoine, Michel, trans. Hugues de Saint-Victor. L’art de lire/Didascalicon. Paris: Cerf, 1991. Lottin, Odon. “La doctrine d’Anselme de Laon sur les dons du Saint-Esprit et son influence.” Recherches de théologie ancienne et médiévale 24 (1957): 267–95. Migne, Jacques Paul, ed. Hugonis de S. Victore, canonici regularis, Sancti Victoris Parisiensis, tum pietate, tum doctrina insignis, Opera omnia tribus tomis digesta. 3 vols. Patrologia Latina 175–177. Paris: Migne, 1854. Mutzenbecher, Almut, ed. Sancti Aurelii Augustini De sermone domini in monte libros duos. Corpus Christianorum, series latina 35. Turnhout: Brepols, 1967. Newhauser, Richard. “The Capital Vices as Medieval Anthropology.” In Laster im Mittelalter/Vices in the Middle Ages, edited by Christoph Flüeler and Martin Rohde, 105–24. Scrinium Friburgense 23. Berlin: De Gruyter, 2009. https://doi.org/10.1515/9783110217377.105. ———. The Treatise on Vices and Virtues in Latin and the Vernacular. Typologie des sources du Moyen Âge occidental 68. Turnhout: Brepols, 1993. Newhauser, Richard, and István Bejczy. A Supplement to Morton W. Bloomfield et al., Incipits of Latin Works on the Virtues and Vices, 1100–1500 A.D. Instrumenta Patristica et Mediaevalia 50. Turnhout: Brepols, 2008. Offergeld, Thilo, trans. Hugo von Sankt Viktor. Didascalicon de studio legendi/Studienbuch. Fontes Christiani 27. Freiburg: Herder, 1997. Ouy, Gilbert. Les manuscrits de l’Abbaye de Saint-Victor: Catalogue établi sur la base du répertoire de Claude de Grandrue (1514). 2 vols. Bibliotheca Victorina 10. Turnhout: Brepols, 1999. Pipe Roll Society, ed. Feet of Fines of the Tenth Year of the Reign of King Richard I, AD 1198 to AD 1199. Publications of the Pipe Roll Society 24. London: Love and Wyman, 1900. https://archive.org/details/piperollsociety24pipeuoft. Poirel, Dominique. “Hugo Saxo. Les origines germaniques de la pensée d’Hugues de Saint-Victor.” Francia 33, no. 1 (2006): 163–74. http://francia.digitale-sammlungen.de/Blatt_bsb00016419,00193.html. ———. “L’école de Saint-Victor au Moyen Âge: Bilan d’un demi-siècle historiographique.” Bibliothèque de l’école des chartes 156, no. 1 (1998): 187–207. https://doi.org/10.3406/bec.1998.450921. ———. Livre de la nature et débat trinitaire au XIIe siècle: Le De tribus diebus de Hugues de Saint-Victor. Bibliotheca Victorina 14. Turnhout: Brepols, 2002. Primo hoc Tomo Operum M. Hugonis a S. Victore contenta Epistola nuncupatoria et epigrammata, Opera tribus tomis hactenus impressa, Loca bibliorum sacrorrum ab Hugone exposita, deinde primi tomi tabula et post erratula. Paris: Jodocus Badius and Johannes Parvus, 1526. http://bibliotecavirtual.larioja.org/bvrioja/i18n/consulta/registro.cmd?id=1026. Quantin, Jean-Louis. “La réception d’Hugues et Richard de Saint-Victor au miroir de leurs Opera omnia (XVIe–XVIIe siècles).” In L’école de Saint-Victor de Paris: Influence et rayonnement du Moyen Âge à l’époque moderne, edited by Dominique Poirel, 601–42. Bibliotheca Victorina 22. Turnhout: Brepols, 2010. https://doi.org/10.1484/M.BV-EB.3.4428. Rehm, Ulrich. Bebilderte Vaterunser-Erklärungen des Mittelalters. Saecula spiritalia 28. Baden-Baden: Koerner, 1994. Rorem, Paul. Hugh of Saint Victor. Great Medieval Thinkers. Oxford: Oxford University Press, 2009. https://doi.org/10.1093/acprof:oso/9780195384369.001.0001. Rudolph, Conrad. The Mystic Ark: Hugh of Saint Victor, Art, and Thought in the Twelfth Century. New York: Cambridge University Press, 2014. https://doi.org/10.1017/CBO9781139583459. Russell, Josiah Cox. Dictionary of Writers of Thirteenth-Century England. Bulletin of the Institute of Historical Research, Special Supplement 3. London: Longmans, 1936. Sannelli, Massimo, trans. Ugo di San Vittore, Didascalicon. De studio legendi/Dell’arte di leggere. Lavis: La finestra, 2011. Sharpe, Richard. “Reconstructing the Medieval Library of Bury St Edmunds Abbey: The Lost Catalogue of Henry of Kirkstead.” In Bury St Edmunds: Medieval Art, Architecture, Archaeology, and Economy, edited by Antonia Gransden, 204–18. Conference Transactions 20. Leeds: British Archaeological Association, 1998. Sharpe, Richard, James P. Carley, Rodney M. Thomson, and Andrew G. Watson. English Benedictine Libraries: The Shorter Catalogues. Corpus of British Medieval Library Catalogues 4. London: British Library, 1996. Sicard, Patrice. Diagrammes médiévaux et exégèse visuelle: Le Libellus de formatione arche de Hugues de Saint-Victor. Bibliotheca Victorina 4. Turnhout: Brepols, 1993. ———, ed. Hugonis de Sancto Victore De archa Noe. Libellus de formatione arche. Corpus Christianorum, continuatio mediaevalis 176. Turnhout: Brepols, 2001. Stammberger, Ralf M.W. “Die Edition der Werke Hugos von Sankt Viktor († 1141) durch Abt Gilduin von Sankt Viktor († 1155) – Eine Rekonstruktion.” In Schrift, Schreiber, Schenker: Studien zur Abtei Sankt Viktor in Paris und den Viktorinern, edited by Rainer Berndt. Corpus Victorinum, Instrumenta 1. Berlin: Akademie Verlag, 2005. Stirnemann, Patricia. “Où ont été fabriqués les livres de la glose ordinaire dans la première moitié du XIIe siècle?” In Le XIIe siècle: Mutations et renouveau en France dans la première moitié du XIIe siècle, edited by Françoise Gasparri, 257–301. Cahiers du Léopard d’or 3. Paris: Léopard d’or, 1994. Sweeney, Eileen C. “Aquinas on the Seven Deadly Sins: Tradition and Innovation.” In Sin in Medieval and Early Modern Culture: The Tradition of the Seven Deadly Sins, edited by Richard Newhauser and Susan J. Ridyard, 85–106. Woodbridge, Suffolk: York Medieval Press, 2012. Tanner, Thomas. Bibliotheca Britannico-Hibernica. Edited by David Wilkins. London: Bowyer, 1748. Taylor, Jerome, trans. The Didascalicon of Hugh of St. Victor: A Medieval Guide to the Arts. Records of Civilization, Sources and Studies 64. New York: Columbia University Press, 1961. https://archive.org/details/didascaliconmedi00hugh. Thomson, Rodney M. Catalogue of the Manuscripts of Lincoln Cathedral Chapter Library. Woodbridge, Suffolk: Brewer, 1989. Valgimogli, Lorenzo. Lo «Speculum Gregorii» di Adalberto di Metz. Archivum Gregorianum 8. Florence: SISMEL, 2006. Weber, Robert, Bonifatius Fischer, Jean Gribomont, Hedley F.D. Sparks, Walter Thiele, and Roger Gryson, eds. Biblia Sacra iuxta vulgatam versionem. 5th ed. 1969. Reprint, Stuttgart: Deutsche Bibelgesellschaft, 2007. Wenzel, Siegfried. “The Seven Deadly Sins: Some Problems of Research.” Speculum 43, no. 1 (January 1968): 1–22. https://doi.org/10.2307/2854796.